Average daily activation count : 43 times a day ! Teenagers are addicted to “TikTok” ! “TikTok” is spreading explosively among teenagers but it seems like the older generation starts to get addicted to this app as well. We will outline “TikTok” below thanks to the data acquired by the mobile analytics tool App Ape. “TikTok” is a video SNS (social network service) application, mainly used by teenagers, letting users post and watch 15 seconds video, and communicate with comments. Because all the videos contain music, it’s also called short music videos community. The attractive aspect of this tool is that anyone can become a content provider because of the ease to use the mobile app from the creation of the video to the post, and the high degree of propagation that a video can reach. Users who becomes popular on TikTok (these users are called “Tiktokers”) and spread their songs to other medias are rare. On the other hand, influencers such as Youtubers that are already popular are joining TikTok and post videos. Users don’t necessarily need to post videos, they can also only watch them. Actually, like for most of other videos medias, the majority are not Tiktokers but just lurkers. This is a chart about TikTok MAU evolution since the app has been released. 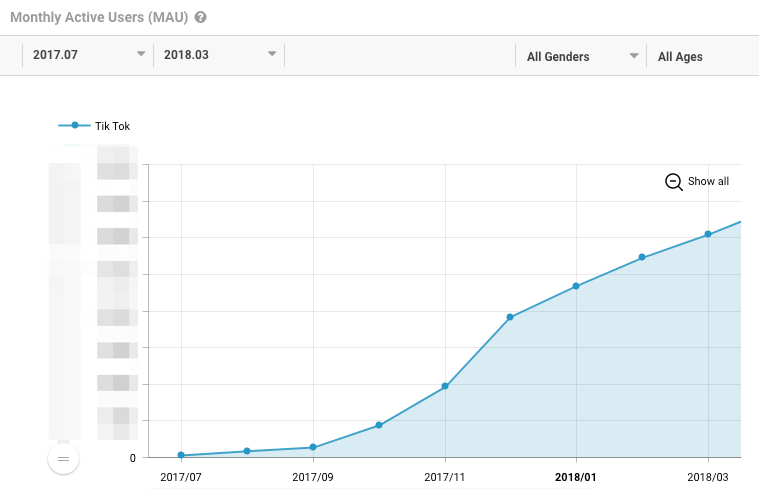 From November 2017 until the end of the year, we can see that the number of users rapidly increased. Since then, it kept growing steadily. We will present below the survey data of TikTok analyzed thanks to original data acquired by App Ape. 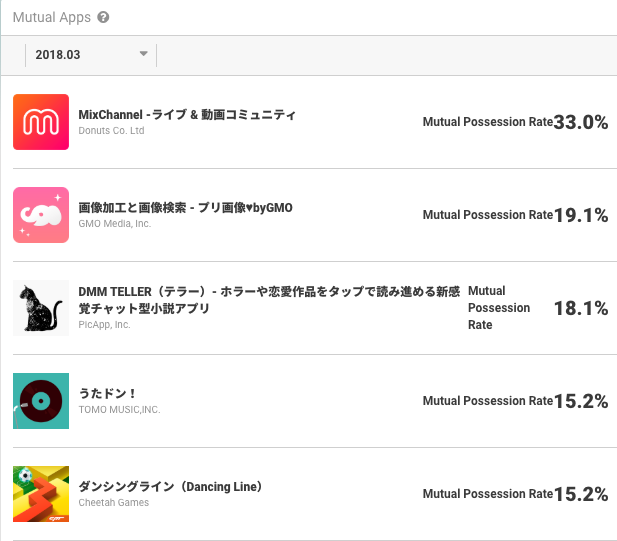 You will find data such as “gender & age ratio”, “average number of activation times per day” and “mutual apps (possession)” obtained by App Ape. If you dig deeper into any data, you will find interesting facts. Isn’t it a teenage only app ? 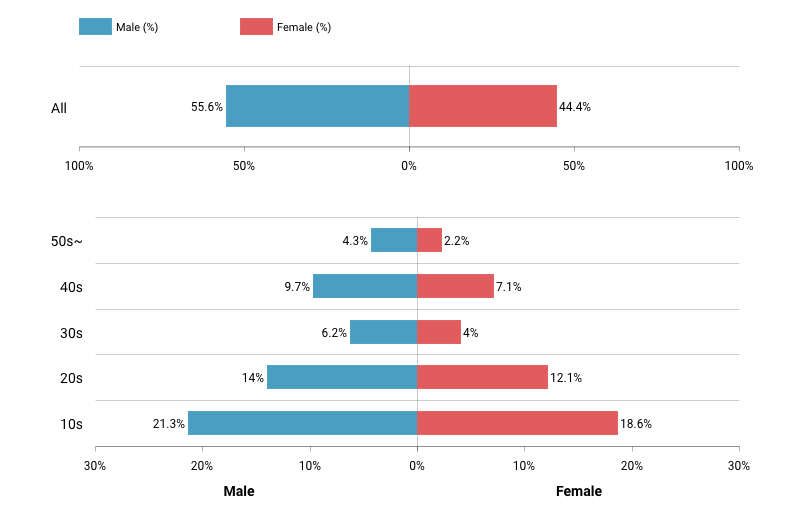 As of March 2018, it seems like there is a lot of men in the users distribution by gender. This topic became a hot trend among high school students girls, who got attracted by the popularity after release, but now the number of male users is higher for any age group. 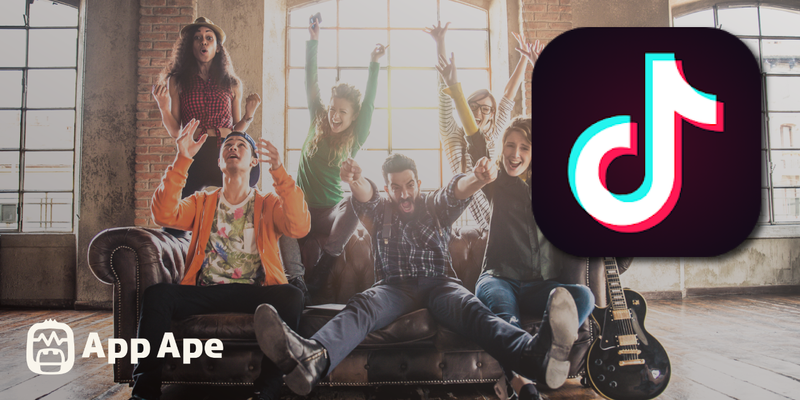 Considering that many users don’t use this app for video posting purposes but for watching purposes, Tiktokers that attracts male users attention may be increasing. Concerning the distribution by age, the number of teens users is overwhelming. It is natural that the number of users decreases as the age increases, but the number of users in their 40s is larger than the number of users in their 30s and 50s or more. This figure is interesting because people in their 40s are part of a non-digital native generation and the ratio of smartphone users in this age range is not that high. According to the data from March 2018, the average activation number is 43.4 times a day ! Assuming the fact that we are active during 16 hours a day (excluding sleeping time), we can see that the average user activated the app around 3 times per hour ! Meanwhile, the average activation count of Twitter, a typical SNS application, is 15.5 times a day. It seems that the difference in the fact of “watching 15 seconds of video” and “reading 140 characters of text” causes a larger number of daily activation. 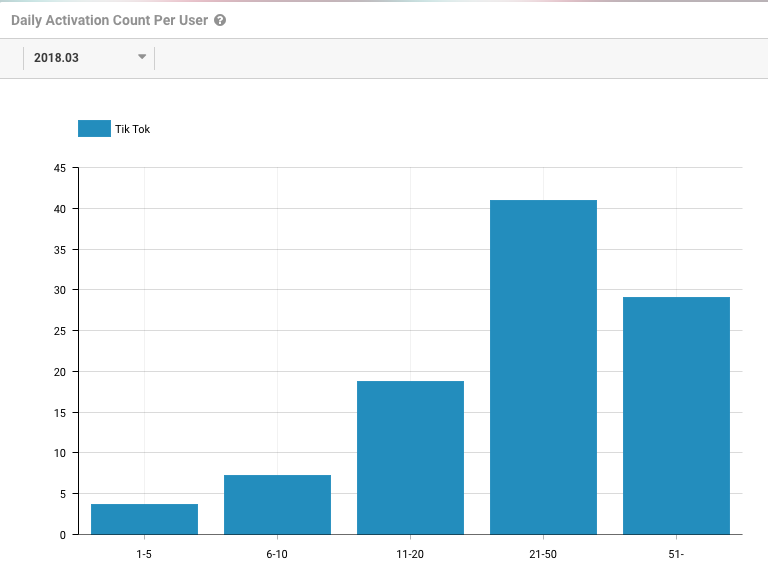 When we look at the distribution of daily activation count numbers of TikTok, 40% of users activate the app between 21 and 50 times, and 30% of them activate the app more than 51 times ! Many users activate the app dozens of times due to the concept of this app. This chart presents the most possessed mobile apps by Tiktok users. Even if those 5 apps can be divided into different categories, they all have something in common with TikTok. “MixChannel” is a video SNS app similar to TikTok. “画像加工と画像検索” is also a community app used to search and retouch pictures. “DMM TELLER” is an application with a unique format, that lets users read novels in a chatting format. It mainly covers romance and horror genres. There may be something that leads users to TikTok, such as the fact that they can read novels quickly. “うたドン” and “ダンシングライン” are gaming applications. Even if it’s not the same kind of app than TikTok, but they’re all based on a musical concept. Will the popularity of TikTok expand mainly among teens ? It’s common for today’s teens generation to possess a smartphone, and it seems that many of them are crazy about TikTok. There may be a feeling from the young generation who wants to fulfill the desire of becoming a popular person. Since Tiktok has an aggressive marketing strategy, other generations also get enrolled into users. It seems like there is a “generational shock” when they start using the app and discover younger users videos, but once they accept it, they often watch and listen to Tiktokers.